Here on the Life in Color blog we love to talk architecture, paint, surfaces and materials but we have been neglecting something. We have discussed wood floors, ceramic tile and even stained concrete but today is devoted to a long loved flooring, the carpet. Even if it feels great on the feet, wall to wall beige carpeting is the bane of many renters, and expensive to replace in the starter home. In commercial installations where carpet typically is glued directly to the concrete floor, there have been incidences of chemical repercussions. In residential situations, sometimes the dyes and synthetic materials used in the manufacture of carpets have been shown to contribute significantly to indoor air pollution. So what is a color lover with a need for warm feet to do? Stair runners, area rugs and carpet tile all give surprising definition to a space without the financial commitment of wall to wall carpet. 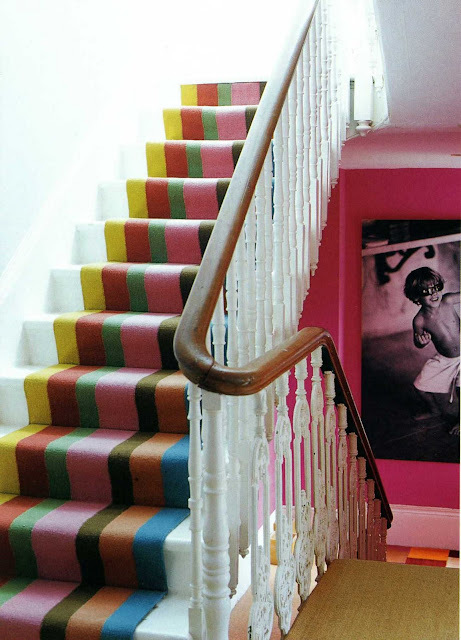 This striped stair runner from Terramia is matched with a bold pink wall. Staircases are the liminal, in between spaces of our homes and this colorful carpet makes it a space all its own, a place you would enjoy passing through. 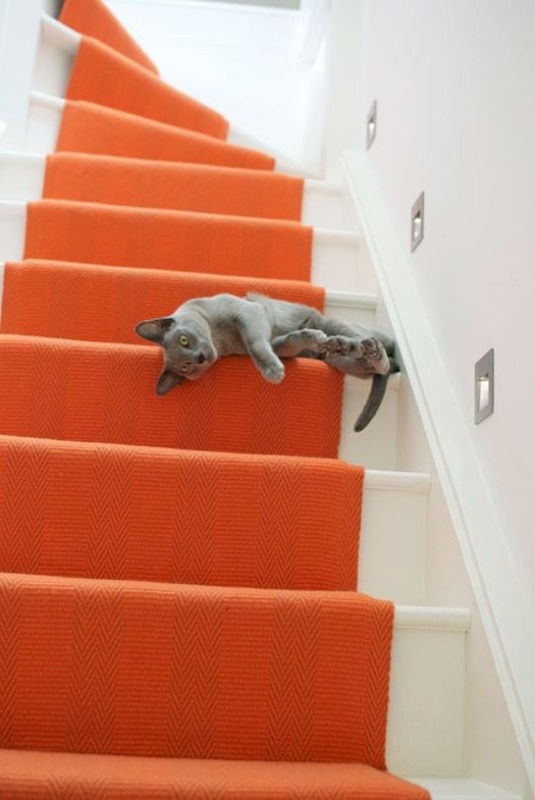 The clean all white space is highlighted with a dense orange that focuses the attention exactly where it should be when using the stairs. For the more creative among us there are carpet tiles. 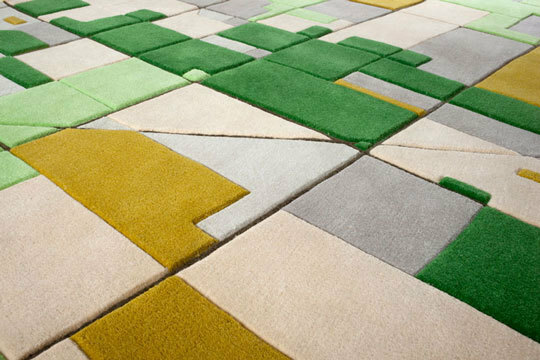 Not only can you mix and match the tiles giving you a paint like level of creative control, the carpet tiles are modular . 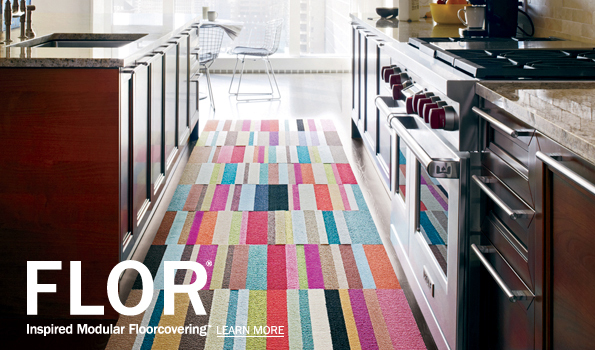 Like area rugs you can switch them our by season or when you want a new look. This area rug demonstrates the visual success an area rug over existing carpet can create. Vibrant color draws the eye making the airy room feel more grounded. The addition of the bold zigzag in eye popping red makes this not just another bedroom, but someones favorite room in the house. When all you have is beige carpet sometimes and area rug is the perfect addition to make a space fell like home. 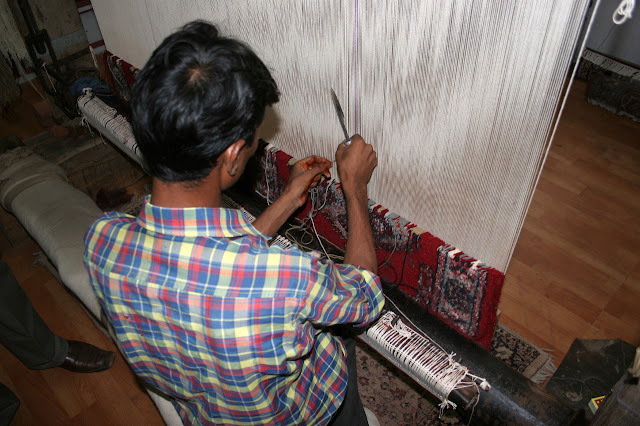 Area rugs are the oldest form of carpet in the world and while today most are made with computerized looms, the originals were and still are made by hand. 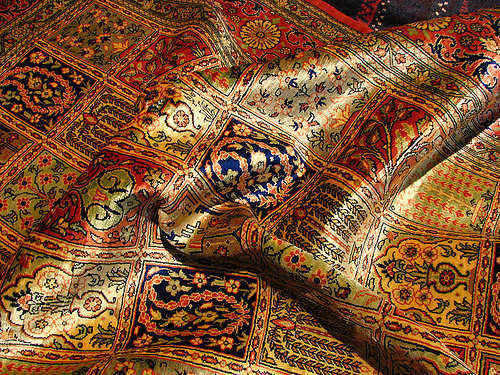 While definitely a bigger investment that their modern counterparts these rugs are beautiful and traditional. When sourced through the right importers, these rugs help sustain the craftsman and women whose families have been making rugs in Iran and surrounding areas since ancient times. 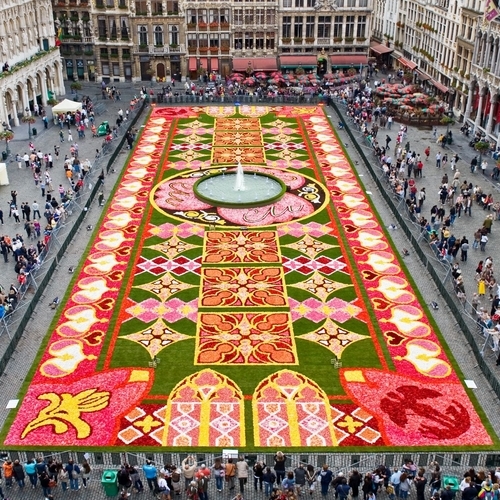 Traditional woven rugs have inspired some astounding outdoor installations including this famous example: The Brussels Flower Carpet. This installation is created every two years in the Grand Place Square, in the the center of Brussels. When you are looking to recolor your home, of course take time to consider the walls but floors too need some attention. What kind of carpets cozy up you space? Hmm nice carpet and it's really pulled the room together. Nice blog and the big carpet on the street looks so beautiful. I am amazed how this big rug came into shape. Nourison Graphic Illusions Area Rug like this rug collection and you guys should have a look at this awesome website. They sells decor and rugs from good brands safavieh, loloi and many more. Hmm nice carpet and it's really pulled the room together. Nice blog and the big carpet on the street looks so beautiful. I am amazed how this big rug came into shape. Nourison Graphic Illusions Area Rug is here http://www.homebrandsusa.com/brand/1/1928/nourison.htm. Like this rug collection and you guys should have a look at this awesome website. They sells decor and rugs from good brands safavieh, loloi and many more. Wow! I like so much the carpet very attractive, perfectly color mix. Were all these created by just one person? Insanely talented. Can you please recommend me some names that will be termed as the best carpet cleaner product for me and i can clean my carpets well. But foam is not much effective for doing dry carpet cleaning. Such a valuable post. Thanks for Sharing! Truly this is very best blog. I've bookmarked this site and i want to say thank you for this blog. I know a firm called larry's tile and carpet serving in Fort Lauderdale. They Provide the best Carpet Flooring in Coral Springs. Very nice information you have shared in this blog. I'll definitely bookmarked this site. I will share this post with my friend who is a flooring specialist in Fort Lauderdale and providing the Hardwood Flooring and Carpet Flooring in Coral Springs also. Make sure to keep children and pets off the recently cleaned rugs until the point when it is dry in light of the fact that there is dependably a buildup left on the floor coverings that can be destructive to children or pets. Continuously let the rugs dry totally and afterward vacuum directly after it is dry to evacuate any leftover contaminants. The most famous cover cleaning strategies used to clean covers are steam cleaning, cleaning and profound cleanser. We will quickly clarify the three most regular cover cleaning techniques utilized today. You are right, it's called steam cleaning and it includes deep cleaning of the carpets with the help of steam to kill germs and infectants into the carpet. Many carpet cleaner expert use this method to deep clean the carpets.